Yonan Codex, passage from Gospel of John 6:64b - 7:28a. 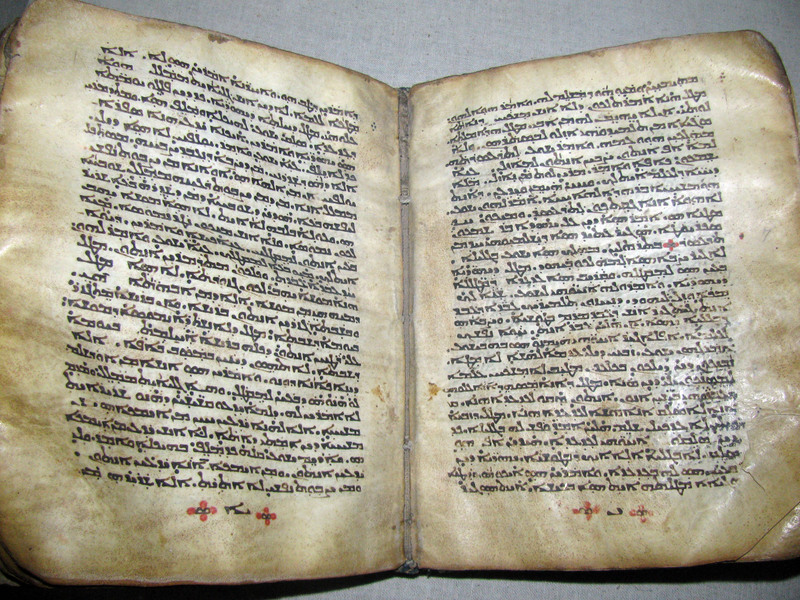 The Yonan Codex, part of the the Van Kampen Collection on display at the Holy Land Experience, Orlando Florida, is the oldest complete eastern Aramaic Peshitta New Testament. It has been variously dated from the fifth to the seventh century. On April 5th, 1955, the Yonan Codex was put on temporary display at the Library of Congress in Washington, D.C. The Codex was the precious possession of the Malek-Yonan family for many centuries. Norman Malek-Yonan was responsible for putting the Codex on display at the Library of Congress. The Yonan Codex contains 227 leaves (454 pages) of parchment. The uniform dimensions of the Codex between the wooden covers is 7 inches (27.5 cm) wide by 83/4 inches (32.3 cm) high. The text was hand-scribed in very legible Estrangelo, in black ink. Each page contains single columns of twenty-nine or thirty lines each. The text begins with Matthew 9:35 and concludes with Hebrews 12:9. The 16 folios (32 pages) at the beginning and 4 folios (8 pages) at the end, are from a more recent date, and scribal hand, with larger letters written in the East Adiabene text, being 21 or 22 lines per page. This more recent scribal addition to the beginning and end, has restored the affinity of the Peshitta text which was rendered illegible through wear. The pages on display here at Dukhrana, are from the centre of the Codex, revealing the original hand-scribed text, and the style of the Estrangelo text type which was used. The passage is from the Gospel of John 6:64b - 7:12a on the left page and continuing with 7:12b - 7:28a on the right page. 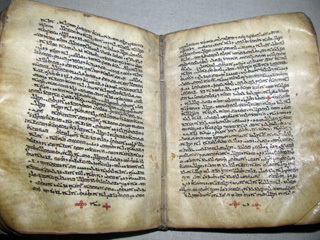 Aramaic is read from right to left. The text is verbatim with the eastern Peshitta. The text of these two pages is virtually identical with the Khabouris Codex and the Crawford Codex as well. Right-click the download link and choose "Save Target As..." to download! We would love to hear from you, so please don't hesitate to contact us with whatever comments or suggestions you might have regarding the Yonan Codex transcription.